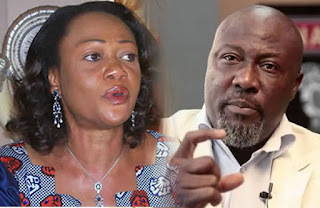 Chairman, Senate Committee on the Federal Capital Territory, FCT, Senator Dino Melaye, All Progressives Congress, APC, Kogi West told the Senate Committee chairman on Women Affairs, Senator Oluremi Tinubu, APC, yesterday that great minds do not dwell on issues, but act and move on. According to Senator Melaye, it would amount to waste of time and energy to continue with the action as he has acted and the next thing to do as a great man, would be to move on. Responding to Senator Tinubu writing the Acting Inspector General of Police, IGP, Ibrahim Idris, asking for Police protection, Senator Melaye said, "great minds don’t dwell on issues, they act and move on. I have moved on". Following her shouting match with Senator Melaye on Tuesday, July 12, Senator Tinubu yesterday wrote to the acting IGP, saying that her life was no longer safe, just as she alleged that Melaye’s brawl with a colleague when he was in the House of Representatives led to the untimely death of his colleague then. In a letter dated yesterday, July 18 and received same date by the office of the Inspector General of Police, Senator Tinubu who noted that it was unfair that the leadership of the Senate failed to rebuke Senate Melaye during the executive session when the ‘fight’ ensued. Senator Tinubu’s letter titled, ‘ Request for Police Protection’ read, ” Iam Senator Oluremi Tinubu, representing the Lagos Central Senatorial District of the Federal Republic of Nigeria. ” During the proceedings of the Senate on Tuesday, July, 14, 2016, I had cause to contribute to a matter of national importance. Apparently dissatisfied with my contributions, Senator Dino Melaye threw caution to the winds, resorted to vulgar abuse of my person and wanted to assault me. ” It was the timely intervention of a number of colleagues which prevented Senator Melaye from unleashing physical attack on me. However, as the leadership of the Senate did not call him to order in the circumstance, he proceeded to threaten my life without any provocation whatsoever. “In view of Senator Melaye’s antecedent particularly in the House of Representatives where a brawl led to the untimely death of a member, I have decided not to ignore his threat to my life.